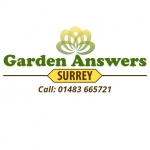 Beautify your landscape with Garden Answers Surrey in Godalming, Surrey. We cover all aspects of soft and hard landscaping and garden maintenance. Established in 1989, our small, local, friendly business have more than 25 years of experience and are able to provide a personal touch. Our very skilled staff of both female and male gardeners are also more than happy to provide advice, hints, tips, and support to help your garden grow. We are fully insured and have a City and Guilds Level 1 and Level 2 in horticulture studies. You get all this expertise at competitive prices by choosing Garden Answers Surrey. Contact us on 01483 665721 for more information.